On Sunday, May 30, the Saskatoon Symphony Orchestra will present its Classics for Kids concert at the Delta Bessborough Hotel at 2:30 p.m. 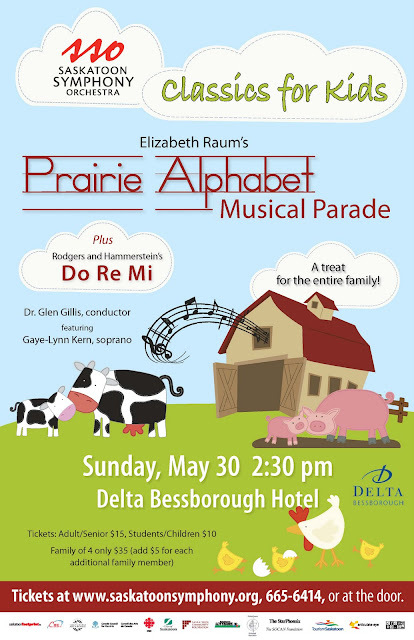 This concert created specifically for children will pay musical tribute to the Saskatchewan prairies through Elizabeth Raum's Prairie Alphabet and Rogers and Hammerstein's Do Re Mi. This special performance by the Saskatoon Symphony Orchestra Chamber Players promises to be a musical adventure with a healthy dose of audience participation. Click here for more information. Tickets are $15 for adults and seniors and $10 for children and students. A family pass for four is $35. Purchase tickets online or call the box office from now until Friday between the hours of noon and 3 p.m. at 665-6414.